One of the premier aerial photographers in the nation, Clyde Sunderland mapped much of the Western states and documented the rise in commercial aviation after World War II during his illustrious career as an aviation photographer. Born in Oakland in 1900, Sunderland graduated from Oakland Technical High School. He also attended UC Berkeley where he studied Mechanical Engineering. Although photography was his hobby as early as 1915, Sunderland started his career as an animation moviemaker in the 1920’s. Photography quickly consumed his interests and he took a job as a commercial photographer covering important news stories for the Oakland Tribune for ten years before WW11. In 1931 he joined the Naval Reserve and was instrumental in setting up the first Reserve photography lab in the country. He was commissioned by Franklin D. Roosevelt to write a textbook and train naval photographers in 1939 and he taught at Pensacola until the end of the war. 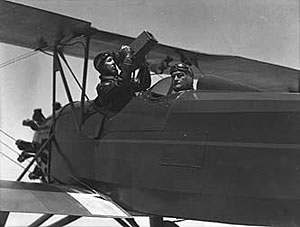 After the war, Sunderland returned to Oakland to turn his passion for photography and enthusiasm for flying into a highly successful career. Working as an aerial photographer for over 40 years, Clyde Sunderland headed the firm Sunderland Aerial Photographs based at Oakland International Airport until his retirement in 1966. Using Fairchild Precision cameras that weighed as much as 90 lbs. each, Sunderland shot three types of photographs: vertical photographs used for mapping an area, continuous strip photographs, and oblique photographs that captured a specific subject at an angle. Each photography plane carried approximately $40,000 worth of equipment on each shoot. During the shoot, the photography pilots had to fly the plane at a steady altitude and speed in order for the camera shutters to click in synchrony with the speed of the plane. Sunderland mapped the entire state of California along with a 2,400 square mile area of Nevada, and a 2,000 square mile area of the Cascade Mountains in Washington using both the vertical and continuous strip photograph techniques. He also documented the monumental construction of the bay bridges and included the bridges in the background of many of his oblique photographs featuring flying machines. Sunderland’s passion for photography reveals itself to us most dramatically in his compositions depicting of some of the greatest moments in early aviation. Photographing planes as they soared past urban backdrops and stunning ocean vistas, Sunderland captured the elegance and splendor of the most technically advanced aircraft of the day, in their initial moments of flight. Sunderland photographed it all, from Amelia Earhart’s inaugural voyage to Honolulu piloting the Lockheed Electra to the extraordinary maiden voyage of the China Clipper when the plane was forced to fly under the Oakland Bay Bridge because it was so laden with goods. Sunderland documented with passion and sensitivity the triumphs of the Golden Age of Aviation. Sunderland’s photographs were reproduced on the covers of Life Magazine and the Saturday Evening Post and were featured in many books and periodicals including National Geographic. He was a member of the Photographers Association of America and was a president of the Northern California Photographers Association. One of the earliest cameras used by Sunderland is now in the permanent collection of the Smithsonian Institute in Washington, D.C. Sunderland died on December 3, 1989 leaving us a rich visual legacy of America’s achievements both on the ground and in the air. COPYRIGHT NOTICE: All works on this website are protected by U.S. and international copyrights. Copyright registrations have been filed for these works with the U.S. Copyright Office. Greg Young Publishing, Inc. strictly enforces its copyrights against any infringer whether large or small. It seeks the maximum damages and attorneys’ fees to which it is entitled under law against all infringers (attorneys’ fees and statutory damages of up to $150,000 per infringement). For questions regarding copyright infringements, contact our counsel, Jeffrey S. Young (805) 884-0338.